In the late 80s Brett Kull, Raymond Weston and Paul Ramsey played in a cover band called Narcissus. One year later Christopher Buzby, Kull and Ramsay formed a band which they baptized Echolyn. Weston returned to the fold and the band made a conscious effort to play solely original material. Thomas Hyatt joined the band on bass during the 1990 recording of the eponymous "Echolyn" debut disc. The band then recorded a follow-up album entitled "Suffocating The Bloom" which drew some attention from certain executives at Sony/Epic Records. They managed to ink a deal to have their next full-length release to be on the Sony/Epic label. 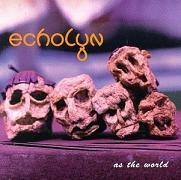 It was in the spring of 1994 that Echolyn entered the studio of Sony Music in Nashville TN and went on to record a classic in the annals of progressive rock: "As The World". Just because they were on a major label it did not mean that the band's musical vision was going to be compromised one bit. Echolyn were on their way and carrying the hopes of an entire musical genre on their shoulders. If this album could do fairly well, the entirety of progressive rock could benefit. Sony's absolute refusal to promote the disc or the band dashed those hopes in a heartbeat but it didn't take away from the quality of the disc. The album's introductory piece. Buzby realized that the band would have access to real strings and so wrote this delicate musical gem. The 3-part vocal harmonies were added to prepare the listener for the vocal-heaviness of the rest of the disc. It segues beautifully into the disc's title track. A track condemning the media's overwhelming influence on everything we do, say, and even think. Although the song has an acoustic overture, it builds up to become a fairly powerful number. This track became a show opener for the subsequent tour. Filled with quirky complexities and dynamic 3-way/ 3-part vocal harmonizations, this track has a lot in common with the sound the band created on "Suffocating" yet shows the band stretching in new directions. One of the more enjoyable aspects of Echolyn's music is the feeling of nostalgia they can create. Many 'warm and fuzzy' memories come to mind while listening to tracks like "Winterthru" or "The Velveteen Rabbit". With "Uncle" the band reverses polarity to unearth some of the darker memories of childhood. Anyone who was ever bullied or victimized as a child in the school playground will immediately identify with the protagonist in this song. This number has fast tempo changes and complex chord progressions. Weston gives a passionately powerful vocal performance. This one seems to have all the elements patently Echolyn and is one the disc's strongest moments. As the title implies, this track is about patience; namely the band's perseverance to reach the point they were at when the track was recorded. This track seems fairly simple and straightforward, yet contains several complex little rhythmic changes and tempos. Lyrically, this one was inspired by Brett's brother Greg's work entitled "A Letter To My Age". It's basically a letter written to himself to be read 25 years in the future. The main musical groove on this one has a very pop, almost Beatles-like, swing to it. The track's closing moments give drummer Paul Ramsay a chance to have a little fun. The cheese, of course, is Echolyn. That they knew they'd end up standing alone after this disc was released is almost prophetic (though in reality, they were singing about the road they traveled, not the one they were about to). This track harkens us back to the "Suffocating" days and sounds like it could have been a part of the "A Suite For The Everyman" epic piece from that release. The first of five consecutive tracks that make up the suite entitled "Letters". It's a short piece that meanders for most of the way through until it segues into the following number. A track that speaks of the responsibility each person must take for his/her actions. This is a beautifully played and sung piece that showcases the band's penchant for writing more spiritual music. The vocal harmonies are sublime and Brett gives us a very tasteful guitar solo about 2/3 of the way in. Based on C.S. Lewis' "The Screwtape Letters", the track is a letter from a demon (Screwtape) to his nephew (Wormwood). Wormwood must discourage his medical patient from choosing the path of eternal salvation or suffer at the hands of his uncle and his minions. Musically, the track is very choppy, filled with musical stabs and inverted melody lines. A very whimsical yet complex piece of music. An old man in a nursing home contemplates his life. "Entry" is a beautiful ballad with lovely harmonic vocals passages. This is a very delicate number which could have easily fit on the "�And Every Blossom" album from the previous year. Ray delivers another heartfelt vocal performance. The track ends on a beautiful musical build up as Brett and Chris each take a solo moment and Paul fills the gaps with some powerful drumming. The suite's closer. Tom takes out his fretless bass on this number. This is another track dealing with the accountability of the individual for his/her actions during his/her lifetime. Not nearly as complex as some of the other pieces in this suite, this track seems like a much more straight-forward number. This is another in a series of nostalgic pieces that make Echolyn such a special band. This extremely short song is from a longer piece Chris wrote for a recital. The Wiblet is a creature from childhood stories (nightmares). This track has a very avant-garde, almost Miriodor-like quality to it. It can be best described as a short essay in noodling. "Verite" is a form of stream of consciousness writing. Apparently the band was "accused" of using this genre of writing by a friend of theirs who couldn't wrap his head around the lyrics to one of their numbers. This is Ray's answer to his friend. Musically, the track is very up-tempo with fast, odd-metered time signatures aplenty. Yet another vehicle to showcase a facet of the band's underrated chops. "We've been here before the grass became green, when the sound was new". The band feels they are where they are based on their own efforts. This is the band's statement of their authenticity and their devotion to their sound. This one contains many diverse musical lines and dynamics which are meshed together very well. Chris also gets to play some real piano and even a little Hammond B-3. This one is a fragile number with some of the best vocal harmonies from Brett and Ray. Christopher's piano paves the way as the song builds in intensity and tempo to become a rather furious track in the closing segments. Its only problem is that it ends with the dreaded fade-out. The album's closer and one of the most poignant Echolyn numbers of all time. It's with songs like this that the band gets ticketed with the "Chrisitan rock" label. However, this track speaks only of hope and never becomes preachy. It's a beautiful vision of the possibility (or assurance, depending on your own personal beliefs) of what happens to a human soul once the body dies. The music is soft and heavenly and returns to the fold the strings and flutes from the opening of the disc. Once again, we get served up some spot-on vocal harmonizations. Whereas the previous number suffers from a fade-out, it seems very appropriate for this number (and thus the entire disc) to end using this technique. One is left to contemplate the message of the song as well as ruminate over the 16 tracks that make up this gem of a disc. Final note: In 2005 the band decided to re-release this classic disc. With Sony showing no interest in the project despite a clamoring from progressive fans that never had a chance to buy the original pressing, the group has re-packaged the disc with a new album cover. In order to entice those who already own the Sony pressing to splurge on this latest pressing, the band has included a DVD of an entire show recorded at The Ritz in Detroit MI. The show was on March 4,1995; two days before the official release of "As The World". Many of the numbers from this great record were played live. This DVD is a worthy addition to any collection of Echolyn material and acts as a testament to the band's incredible song writing, stage presence and tight playing.